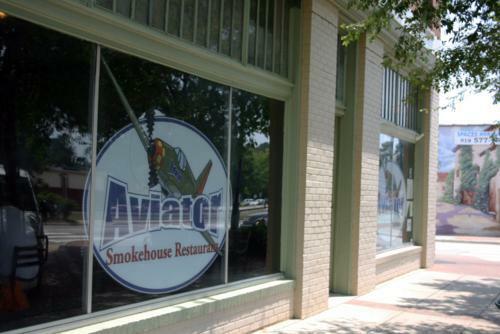 The Aviator Smokehouse in downtown Fuquay-Varina is an offshoot of the Aviator Brewing Company, which is a favorite of plenty of Triangle-area beer drinkers. That beer connection carries over to their menu. The first thing I noticed under the list of sides was a proclamation that a cold beer makes the best side there is for smoked meat. Beer also appears as a confirmed or hinted at ingredient in many of their menu descriptions. That menu is mostly of—I’m struggling not to say barbecue here, because I think North Carolinians don’t consider smoked meat to be barbecue—well, it’s a meat-heavy joint. 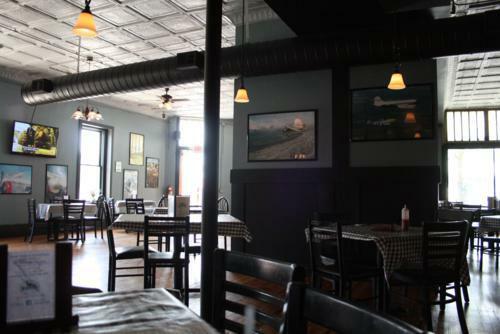 The smoked offerings include beef brisket, St. Louis style ribs, pulled pork with and without an East Carolina barbecue sauce, and wings that are smoked and then deep fried. All of the above come with a choice of two sides including the standard mac and cheese, coleslaw, fries, collards, beer-stewed beans, and so on. 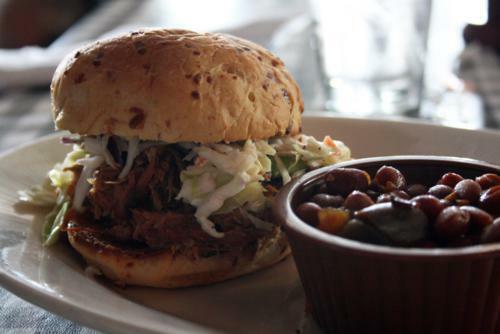 If slabs or piles of meat aren’t your thing, they also offer a brunswick stew, meat in sandwich forms, bratwursts, burgers, nachos, and a few other options. For the real meat lover, try the Boil Over Burger with cheddar, bacon, brisket, pulled pork, an onion ring, barbecue sauce, fries, sour cream, and caramelized onions. Seriously, if any of you ever try that, I want a picture. 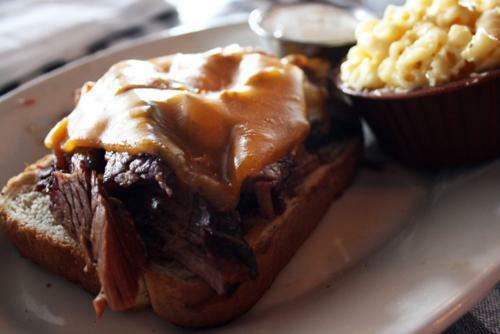 I opted for my meat in sandwich form, choosing the brisket sandwich of meat on sourdough with cheddar on top. The menu didn’t advertise that it was an open-faced sandwich, but I didn’t mind that—who needs the extra bread? The beef was great; they know how to smoke their meats. The sandwich overall, however, was too plain and greasy for me, not to mention severely lacking any sourness in the bread. But the bread was buttered and toasted, making it super easy for me to inhale all that grease. My mac and cheese was good, midway between creamy and dry. My friend had the smoked pork sandwich with the beer beans, and she added coleslaw onto the sandwich. She seemed pretty happy with it and has enjoyed coming to the Smokehouse a few times. Her one-year-old approved of the mac and cheese heartily. I think the prices were right on point at the Smokehouse, and I’m pretty sure meat lovers would be content, and possibly thrilled, here. For me, more of a meat accepter than a lover, it didn’t offer much to tantalize me, but it did what it does simply, allowing that smoked flavor to come through. Hmm, yeah it does sound like just a meat/restaurant acceptance rather than a glowing review. That being said, it’s still on my list of Places to Try! As a beer lover, it should be on your list! Yeah, my chicken rating is the rating of ambivalence–no complaints and I’d definitely eat there again, but I wouldn’t go out of my way to get there. I do think the smoked meats are probably a big draw for meat lovers–they seemed really nicely done, but I’m not a good judge of that. The sides and other parts of the dishes weren’t terribly notable. Although, I have always enjoy the Beer at the depot bar across the street on Saturday 12 May 2012, this was my first time ordering food at the Smokehouse. After waiting 45 minutes for the order, I inquire about the food and the large bartender was extremely rude to me. After talking to the young “manager”, I realize that this situation would not end. It is difficult to judge the food when the service is rude and unprofessional. I do not ever plan to eat or spend my money in this establishment. My recommendation is to avoid this place. Thanks for the comment, John64! I’m sorry you had a bad experience–the service was fine when I went last year, nothing exceptional to note either negatively or positively, but if you came across two staff members unwilling to address your concerns about slow food, I’d say that’s definitely a reason for pause.